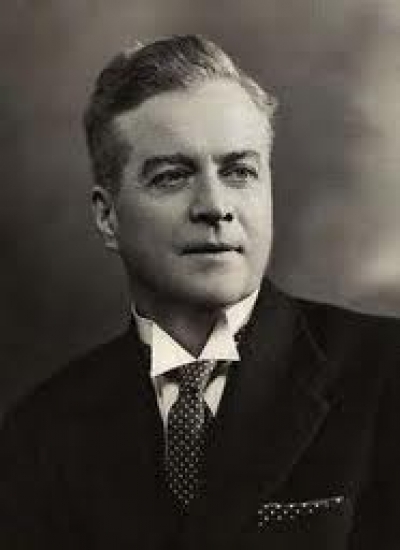 Today in Masonic History Lionel George Logue is born in 1880. Lionel George Logue was an Australian speech therapist. Logue was born in College Town, Adelaide, South Australia on February 26th, 1880. He attended Prince Alfred College between 1889 and 1896 and was unable to decide on a major until he discovered Longfellow's The Song of Hiawatha. At that point he decided to put his love of voices to use. He left school and received elocution lessons from Edward Reeves. Logue worked as Reeves secretary and assistant teacher until 1902 while he attended the University of Adelaide where he studied music at their Elder Conservatorium. In 1902, after Logue's father passed away, Logue opened his own practice to teach elocution. By 1904, he had decided to take a contract with an engineering firm that was putting electricity into a gold mine, some 2,000 kilometers away from his home. Logue began his professional career in Perth, Australia. There he taught elocution, acting and public speaking. He also put on plays and gave recitations. In 1911, Logue and his wife set out to tour the World to study methods of public speaking. Shortly after he developed treatments for Australian war veterans and those who had impaired speech due to shell shock in World War I. In 1924, Logue took his family to England, they would remain there for the rest of Logue's life. In 1926 he opened a speech-defect practice in London. It was there that he met the Duke of York, who would become King George VI. The Duke was seeking help from Logue with a stammer that he had. In 1925, The Duke gave a speech at Wembley that was an ordeal for both the speaker and the listeners. Logue diagnosed the Duke with poor coordination between his larynx and thoracic diaphragm. Tension inflamed the problem. Logue prescribed exercises that the Duke performed for an hour each day. This gave the Duke the confidence to relax when public speaking. Logue worked with the Duke through the 1930's and 1940's. With Logues's help the Duke was able to rehearse and get through the major speeches that he needed to give, including his coronation as King George VI and radio addresses he gave to the British Empire during World War II. The two men would remain friends until the King passed away. The book and subsequent movie The King's Speech was written by Logue's grandson about the friendship between the two men. Logue passed away on April 12th, 1953 in London. Logue was a member of St. George's Lodge, now J.D. Stevenson St. George's Lodge No. 6 in South Perth, Australia. He was raised in 1908 and became Worshipful Master of the Lodge in 1919.